It has to be said, Edinburgh’s cultural scene is not particularly fashion-centred, however a few wee gems do pop up here and there. So, one Saturday morning, having done a quick search online for a much-needed excursion, I jumped at the chance to see Viviane Sassen’s retrospective, In and Out of Fashion, at the Scottish National Portrait Gallery. This is a small scale showcasing of Sassen’s fashion photography from the years of 1998-2012 contained in one modest, yet dynamic, room. Having shot campaigns for Miu Miu amongst other brands, and editorials for magazines such as Dazed & Confused, Sassen has earned a place among the great photographers of contemporary fashion as well as being a cutting-edge photographic journalist. Sassen divides her photography into two categories: art and fashion. The title of this retrospective refers to her interchangeability between the two, and in the past she’s disclosed that the better pay of the fashion commissions have financed her more personal project of documenting life in Africa, where Dutch-born Sassen spent the majority of her childhood. It’s a period that has continued to offer up strong memories, its light, heat and colours regularly feeding into even her commercial fashion editorials. 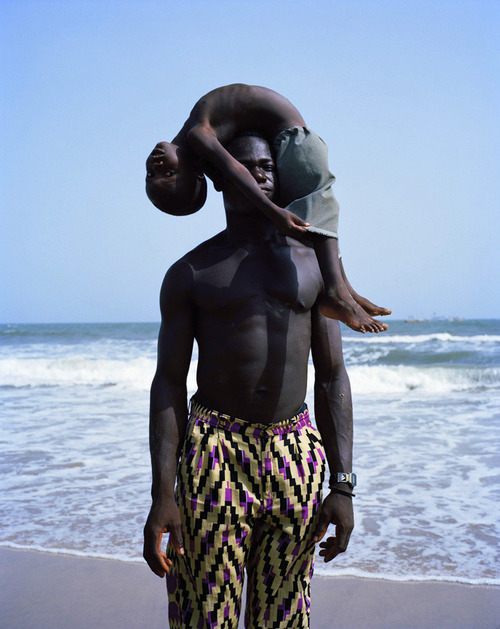 Tellingly, her most recognised photograph is one depicting the figure of an African man with his son balancing on his father’s head like a gymnast, head down and bent backwards. The calmness of the composition is what makes the image so memorable. Both shadowed faces of the figures are tranquil while they partake in what should be in an uncomfortable position, their anonymity juxtaposed against a crisp blue coast. The theme of anonymity runs through In and Out of Fashion, props, paint, photoshop and posing function to prevent the complete display of the subject’s face. On many occasions, the model becomes a part of the natural environment, a scene upon which the spectator has unwittingly stumbled. One of my favourite images showed two models seemingly asleep but in a backbend, their naked torsos strewn with the long grass of the field in which they lay – a rather unorthodox spot for a doze. Sassen’s photography is certainly unconventional; it’s unapologetically raw and off-the-cuff. Having gained a reputation for her cool disregard for glamour, Sassen choses to revert photography to its most elemental form, focusing on colour and high definition. Her particular use of mirrors is widely recognised: the employment of the man-made object created new dimensions within organic habitats, and this beautifully executed experiment became her trademark. Perhaps the anonymity of the models refers to the days of Sassen’s teenage years spent taking nudes of herself and college friends in a bid to ‘explore her sexuality’. One thing, however, is clear: with Sassen’s new vision, the ‘male gaze’ which had lingered so obtrusively on fashion images was dispelled, and a new focus on artistic visuals was brought to the female form. Though its works are very select, the impact of this fragment of Sassen’s portfolio was, for me, wholly worth the 30-minute commute into New Town for the free (bonus!) admission. In and Out of Fashion is a golden find. So if you, like me, are in serious need of a dose of some vibrancy in this bleak winter and enjoy a good photo or two – head to the Scottish National Portrait Gallery. Viviane Sassen | In and Out of Fashion is on display at the Scottish National Portrait Gallery from now until the 2nd of February 2014. Charlotte Dawnay is a student at Edinburgh University. She studies French and Spanish. She loves the work of surrealist artist Joan Miró and has a terrible addiction to avocado. This we’ve noticed is a common problem and although we cannot recommend anything to treat this addiction, we do sympathise with Charlotte. We most definitely do. I read this article and found it very interesting, thought it might be something for you. The article is called A Bold Impression: Viviane Sassen | In and Out of Fashion and is located at http://prancingthroughlife.com/2013/11/26/a-bold-impression-viviane-sassen-in-and-out-of-fashion/.